The date of December 1st marks the anniversary of one of the saddest moments in brewing history. It was early on a Friday morning in 1905 right after Thanksgiving Day when a fire broke out totally destroying one of the state of Michigan’s oldest breweries. Ending a 40 plus year run of being the main quench of the county’s beer thirst and one of the events that led to a change of the drinking habits of it’s 32,000 citizens. What makes the story even sadder? The brewery that burned to the ground was right here in Monroe, MI. That’s right, Monroe had not only lost it’s biggest brewery but it also lost a gathering place and perhaps its own beer identity. 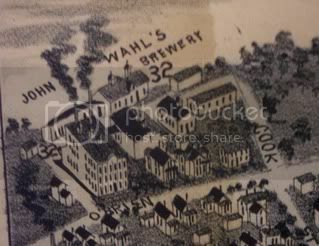 The story of Wahl Brewing Co. starts in the early 1860s when John Wahl sold his half of his Adrian business to his brother and moved to Monroe in the hope of brewing beer. He opened his brewery on O’Brien St. (off of what is now Front Street, just west of St. Michael’s Church). Being born in Bavaria he came here to brew a lager possibly a Pilsner beer style that since it’s creation in 1842 had quickly grown in popularity and soon would be the backbone of the American brewing industry. The country’s taste for rum and whiskey in the early 1800s had led to an early temperance movement that eventually led to alcohol consumption going down from 7 gallons to 2 gallons per capita per year by 1850. However, Americans didn’t give up their drink easily. Anti-temperance riots had broken out across the country. Even the leaders of the temperance movement realized that at this time prohibtion was an impossiblity. Also, with the Civil War on the horizon the temperance movement took a back seat to America’s biggest issue, slavery. But a strange thing happened out of all this… a compromise was inadvertingly met. Lager would be the new drink for America. Family friendly beer gardens seemed so much nicer than dank saloons, some connected with houses of ill repute. The German style drinking seemed more fun with games a sing-alongs. In fact, this is one of the factors that helped in acceptance of German immigrants. Drinking water at this time was not as clean as it is today and a lot of breweries sold their beer as a healthy and clean substitute. Lesser alcohol content also helped to sell the new American product. For example, George Staats, a Brooklyn brewer went on trial for violating the city’s Sunday drink law. Scientist argued that it was near impossible to get drunk 0n 3% and that a person would feel too full to drink enough to get drunk. He was found innocent because the jury found that lager is not intoxicating. This new feel good attitude toward lager created a boom market for German brewers and helped John Wahl become one of Monroe’s most influential citizens. John Wahl ran his brewery for 20 years. The brewery supported his family which included two daughters. He then handed control over to his nephew, also named John Wahl, in May of 1882. He had worked in the brewery for a number of years. 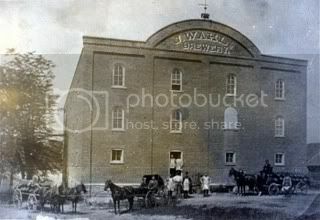 The Wahl Brewery became the most successful brewery in all of Monroe County. Dray-men shipped their beer all over the county to private homes, stores and saloons. Saloons in Erie, Carleton, Dundee and Milan and even places outside of the county such as Flat Rock and Toledo served Wahl beer. Wahl brewing included a three story brewery, malt house, barn for their horses, storage facility and office. It was a great time to be a brewer. By the 1890’s, Americans drank an average of 15 gallons of beer a year. Wahl Brewery employed 25 men and had added a bottling line, 2,050 bbl cask and new 60x40x18 ice-house. The ice was cut right out of the River Raisin. The brewery was also a great place to work. The diary of John Schneider tells of how he was treated like a king by the Wahl family in his short stint as a brewer here. 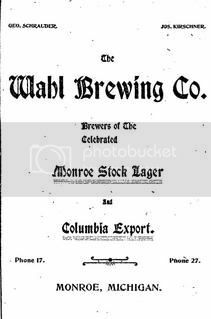 The brewery’s beer included Monroe Stock Lager and Columbia Export. I imagine that the Columbia Export was named after the big event that year, World’s Fair Columbian Exposition in Chicago. It was in honor of the 450th anniversary of Columbus’s voyage and has gone down in history as the most infamous beer competitions ever. It is where Pabst Blue Ribbon got it’s “Blue Ribbon”. The brewery would hold celebrations for local politicians on election night for success at the polls. Mary Weiss, a resident of Monroe, tells of a story when she was a kid pushing a wheel barrow to get a load of malt for her cow that cost 5 cents. Breweries today give their spent grain to feed local livestock. John Wahl the founder of the brewery died in 1886. Unfortunately, after that, the history of the brewery gets get a bit hazy. Around 1897 John Wahl, the nephew, turned over the operation of the business to Joseph Kirschner and George Schrauder. However, It still remained a family business since Joseph Kirschner was the son-in-law of John Wahl the founder. John Wahl the nephew stayed on in some capacity. In spite of all the things that can go wrong such as huge brewers whom could afford to buy tied houses, British investors buying breweries to merge them , and what would get all breweries by 1920 – the Anti-Saloon League. – Wahl Brewing Co. thrived and survived these challenges. It even survived a near-miss in October of 1901 when another fire almost destroyed the brewery. Luckily, a thick brick wall that divided the brewery saved it from spreading. The sad end to the brewery started a 2 am on December 1st, 1905. The fire broke out in one of the barns and was discovered by John Wahl’s (the nephew) son Benjamin. A northeastern wind blew the flames to the rest of the property destroying the brewery and many of the surrounding buildings. The wind shifted to the southwest and burned down Mainzinger’s warehouse and tannery. The Wahl home was saved from the fire as was the bottling building along with some of the stock. The demise of Wahl Brewing left one Monroe brewery – Roeder Brewing Co. Yet, there was a huge gap left in the beer business in Monroe. In came the outside breweries. Goebel, Stroh’s, Detroit Brewing Co. and Koppitz-Melchers were all out of Detroit. Buckeye Brewing out of Toledo and Springbrook out of Adrain were all trying to fill the void. Marx Brewery out of Wyandotte had tried for years to be more prominent in Monroe County but there is no proof of much post Wahl Brewing success. Some of these breweries hired people from Wahl to work as agents. Even-though John Wahl had, according to his obituary, got into the business of coal, he was still connected to the brewery business through Goebel. It seems he used his bottling building to bottle for Goebel. It had to be a big coup for Goebel to get his name attached to their beer. Joseph Kirschner’s son John became a Buckeye beer agent and ran an office and warehouse here in Monroe. The Wahl Brewing Co’s story is no different than a lot of small town breweries from this era. In 1876 there was 4,131 breweries in the U.S. The typical business cycle of a boom was playing out. Also by 1909 over half of the population in America lived in “dry” counties, towns, or states. By 1917 the number of breweries in America was down to 1,237. The combination of Prohibition and changing America’s taste destroyed the small town brewery. Luckily there is a new hope. The emergence of craft beer has brought back the small town brewery. Monroe will hopefully get a chance to have it’s own brewery. A place where people can meet to talk brewing. A place where one can go and grab a growler to take home. A place that gives Monroe back its own beer identity. This entry was posted in Beer History. Bookmark the permalink. Established in 1845, the original building was destroyed by fire in 1875. The plant was rebuilt and continued to produce beer until prohibition years. In 1933 beer production was resumed and has continued to the present. It would be great to have a new brewery in Monroe MI but maybe it should have extra fire protection? The last brewery in Monroe, Roeder Brewery, burnt down in 1909 so there is a history of brewery fires in towns name Monroe. Nice and informative, Kevin. Thanks! Is this where the term fire-brewed originated? I currently own the Wahl family home and am very familiar with the stories. I am restoring the home to the 1860’s era but it will take a while. The ice-house and some of the out buildings were on my property. Any time I dig in my yard, and down by the river, I pull up tons of artifacts, etc. So much so that I don’t even bother with shards of glass, plates, etc. as they are everywhere. By the river you can still see limestone foundations, tons of metal, (iron) re-enforcing rod that can be seen in one of the 1905 photos of the destruction, and much more. Several years ago, the Monroe Archeology Society did a test dig and we found the foundation of the ice house/office and more. Apparently, the majority of the ruins were buried (what was not hauled out or re-used – supposedly the house to the west of mine was built from the bricks of the main brewery building). Cutting the grass is a challenge due to sink holes and pockets of collapse from piles of debris, etc. On December 1st every year, I look out the window that John Wahls’ nephew supposedly did when he noticed flickering orange lights on his ceiling. Keep fire extinguisher on hand just in case. FYI – from what I understand and I believe was in his obit, John Wahl came from Canada/upper state New York and was a mason by trade. Apparently he built St. Michael’s Church and then bought the brewery in 1862 or 63 from Herman Mathis. I have a photo copy of a Monroe directory in 1859 that has “Herman’s Brewery – O’Brien Street – A large stock of lager and beer always on hand” – or something close to that. Additionally, I believe there was a fire in the complex in the 1870’s but it was repaired and the massive brick structure was built. Thank you Brian, I was hoping for a reply like yours. Great information, I couldn’t find the founder John Wahl’s obit and I really needed that to varify some of the information I had. This was my first attempt at archiving and I found a lot of contradictory information. I have an ad for the brewery that says it was started in 1862 but I found another story that puts the start of the brewery in 1857. According to the census there was no John Wahl here in 1860 so I went with the early 1860s. In the 1870 census it said he was born in Bavaria but I do remember something about Canada/Upper New York before he moved to Adrian. I also have that Herman’s Brewery ad from the 1859 Monroe Directory and will have a blog on that later. The 1860 census has Herman Mathis'(Hermann Brewery owner) name as”Mattis Hammond”. That is the kind of thing I kept finding. Once again thank you. Good luck with the restoring project. If you ever have an historical home tour I would love to know about it. In your digging into the Wahl Brewery, did you come across any information on a wholesale fish business named The J.N. Dewey Co.? It was in operation in the 30’s. I am trying to place it and suspect it was on O’Brien St. but am not sure of that. If you respond to this with your e-mail address, I will forward a picture of the fish building. In response to the Vince Banks blog, I am the great grandson of Jesse Nelson Dewey, i.e. J. N. Dewey. I can give you much information about the fishing business that operated both at Brest, Michigan and Toledo, Ohio. I have reason to suspect that your picture might be of Toledo. I can say for sure when I see it. The fish business was never in Monroe proper. I never read about any connection between the two families but Libbey being the bottle supplier is a possibility. If I ever get my Wahl bottle back that will be the first thing I will look for.